Located in the picturesque village of Steeple Morden, nestled between the bigger towns of Royston & Baldock. Ashwell and Mordens station is just over a mile away and provides a regular service to Cambridge and London Kings Cross. This location is ideal for commuters with easy access to the A1M & M11 not forgetting Stanstead and Luton Airports which are also on your doorstep. This contemporary apartment makes up part of Woodland Grange a charming development set in seven acres of landscaped gardens and natural woodland a welcoming retreat to escape to and enjoy the peace and relaxation this tranquil setting has to offer. A private driveway leads to electric gates which provides the entrance to this beautiful complex. This charming duplex apartment has its own private entrance and internally along with the open plan living area, modern kitchen with integral appliances and stylish bathrooms, the master suite has a balcony which provides panoramic views across the lovely grounds and countryside beyond. Front door with decorative glazed panels. Fitted with a white suite comprising low level WC with concealed cistern and vanity wash hand basin with mixer tap. Frosted window to front aspect. Inset lighting. Approx 14' 5" x 14' 0" (4.39m x 4.27m) Bright and airy living area with window to rear aspect and French doors leading out to the small private garden and the beautiful grounds beyond. This well-appointed room provides ample space for everyday living with inset lighting and wall lights. Approx 9' 7" x 6' 5" (2.92m x 1.96m) A modern kitchen fitted with a range of high gloss cream and contrasting walnut wall and base units with lovely granite work surface. One and half bowl inset sink with mixer tap over. Integrated appliances include microwave, fridge/freezer, washing machine, dishwasher, oven and hob with extractor hood. Complimenting under unit lighting with further inset lighting. Gallery landing with doors to all rooms. Storage cupboard. White suite comprising large walk-in shower with sliding door, low level WC with concealed cistern and vanity wash hand basin with mixer tap over. Part tiled with matching floor tiles. Inset lighting. Approx 12' 4" x 7' 9" (3.76m x 2.36m) Small double bedroom with window to front aspect. Part tiled and fitted with a white suite comprising panelled bath with shower attachment, wall mounted wash hand basin and low level WC with concealed cistern. Inset lighting. Heated 'ladder style' towel rail. Fully enclosed, low maintenance rear garden with paved patio. Personal gate leads out to the formal residents garden and the lovely seven acre woodland beyond. There is a large residents car park located to the side of the building with ample visitors parking. Lease Information: - 125 years from January 2008 - 107 years remaining. The EPC rating for this property is C. A full copy of the EPC is available on request in a PDF email format or can be viewed in our offices. Disclaimer - Property reference 11962465. The information displayed about this property comprises a property advertisement. Rightmove.co.uk makes no warranty as to the accuracy or completeness of the advertisement or any linked or associated information, and Rightmove has no control over the content. This property advertisement does not constitute property particulars. 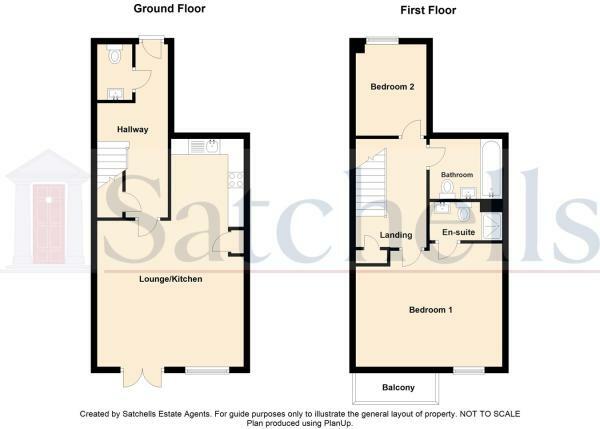 The information is provided and maintained by Satchells Estate Agents, Baldock. Please contact the selling agent or developer directly to obtain any information which may be available under the terms of The Energy Performance of Buildings (Certificates and Inspections) (England and Wales) Regulations 2007 or the Home Report if in relation to a residential property in Scotland.